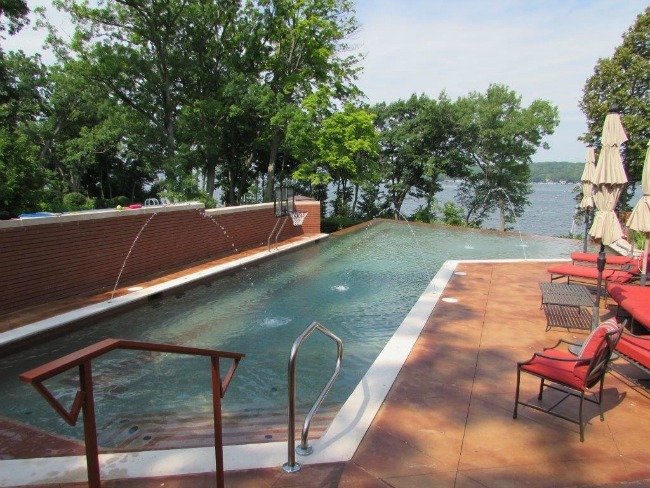 When Barrington Pools creates a luxury swimming pool design, we understand that you are investing in the aesthetics of your home and that you are creating outdoor living possibilities for you, your family, and your friends. Custom pool design ideas come in endless shapes, but stylistically can be narrowed down to five styles: Classic, Modern, Free Form, Natural, and Vanishing Edge. Visit our Gallery to see hundreds of pools in a wide variety of shapes and sizes. The property and the lifestyle you wish to have around your pool will have a major influence on the style of pool. 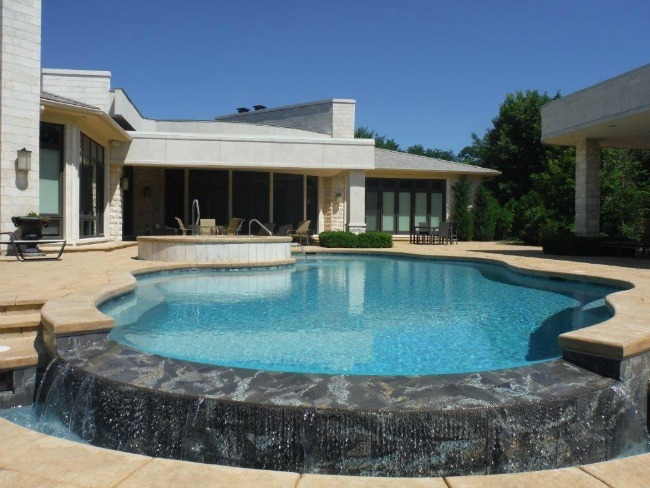 Your Barrington Pools design consultant will provide you information regarding the merits of different styles and advise on which best suits your vision. The possibilities are truly endless. Classic pool designs feature clean lines, arches and 90 degree angles that evoke a Mediterranean look and feel along with straight lines used to create dramatic focal points. Classic swimming pool designs can be built with Grecian or Roman themes and may include decorative details including, columns, statues, mosaics, and custom tile work, to accentuate the motif. Modern pools are, in a word, square. Can something square be cool? Yes. Create your Zen space with a modern pool. Designs can be very elaborate and can be planned to complement the architecture of your home—even it is not a modern style home. Freeform pools have become a popular swimming pool design style to create a focal point for your backyard gathering space. This style is a great solution to increase the size of your pool around existing architecture and landscaping. The key design feature here is irregular curves and rounded edges. This style of pool is also extremely well suited for building on smaller lots or where there may be obstacles that need to be designed to avoid. Natural pools feature design elements including curves, soft angles, natural rock and vegetation to recreate what is found in nature. They often also feature water features such as waterfalls to continue that sense of nature’s beauty. The absence of rigid angles and straight lines creates a swimming pool that complements your surroundings. 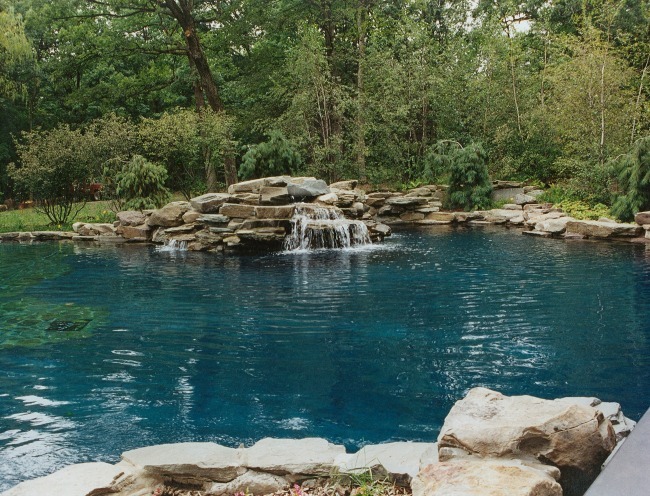 Natural pools can be built with stone decking, a sloping beach entry, waterfalls, and other rock features. Vanishing Edge poolsare also referred to as negative edge pools, infinity edge pools or zero edge pools. Vanishing Edge swimming pools create a stunning visual effect by featuring at least one side over which water continually flows into a catch basin below. The vanishing edge draws your eye beyond the edge of your swimming pool, because the visual ‘stop’ is the horizon, instead of the edge of the pool itself. 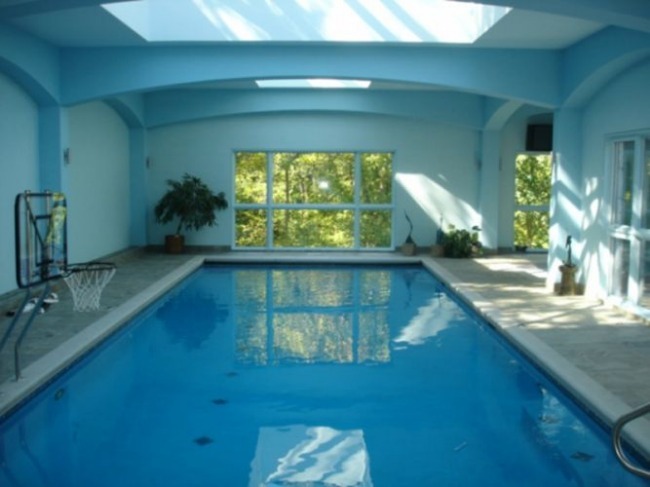 Chicago weather isn’t always warm and sunny, so you may want to consider an indoor pool. These pools can be designed with almost any of the features you can get outside. Only the size of your proposed indoor space limits what we can design for you. Lap pools and fitness pools are designed specifically for athletics and for the sport of swimming. There’s nothing saying that you can’t just sit in the cool water on a hot day and relax though! These pools typically have one or more lanes specifically dedicated to swimming and may include rope guides and markers on the pool floor to help guide the swimmer. Many lap pools feature a classic or modern design but we can also integrate diving platforms and swim lanes into any other design, including natural pools and freeform pools. When considering what design elements you love, it’s important to consider that despite a pool falling into one style it is extremely common to have elements from another. For instance, your fitness pool could have a vanishing edge and a natural rock waterfall. 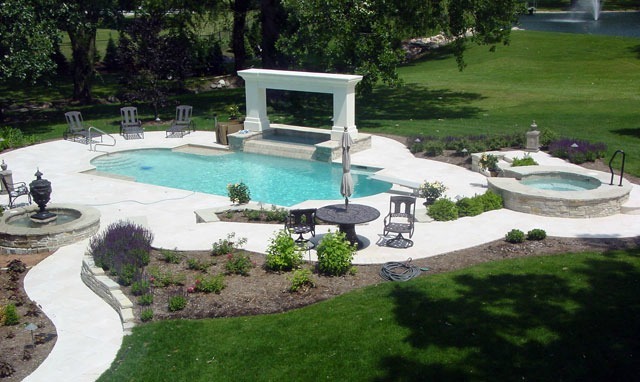 Our goal is to design the perfect pool for your personality and desires. Whatever pool design elements might be included is up to you! Barrington Pools can make that a reality, from the height of luxury evoking a classic Roman villa to a tranquil natural pool designed to help you escape the “real world”.